Local carpenter Jonathan Seaton is the proud owner of a new Sprinter van. This is not your run of the mill Heavy Chevy. This is a real van. 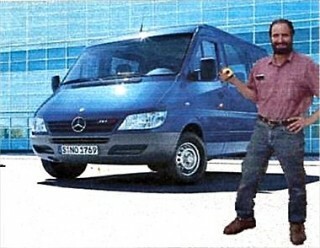 His Sprinter is packed with state-of-the-art engineering and Mercedes top quality. Power steering, a tight-turning radius and advanced safety features guarantee you perfect handling in any road situation. The roomy cab, ergonomic interior and instrument panel and comfortable climate-control options provide Jonathan with a comfortable place to work – a compact van with a great big heart. For the sake of the environment, his Sprinter is available with two alternate drive systems – the 308 E Sprinter with electric drive or the NGT Sprinter which uses sequential natural gas technology. However Jonathan’s Sprinter will come equipped with a high performance Intercooled twin-turbocharged 5,513-cc SOFIC 36-valve 60° V-12 engine producing 493 hp @ 5,000 rpm and an amazing 590 lb-ft torque @ 1,800 – 3,500 rpm, coupled to a Driver-adaptive electronic 5-speed automatic. This sleeper will do 0-60 mph in 4.6 seconds. Cockpit Management and Data system integrates navigation, AM/FM stereo/weatherband radio. in-dash single-CD player/CD-ROM drive, and controls for CD changer and phone with a 6.5″ color-LCD in-dash screen. Fiber-optic network offers precise. high-speed communication among components. Bose® sound system with 8 speakers includes a dash-mounted center fill speaker and a 10″ Nc1(4) Neodymium Iron Boron high- efficiency woofer. Bose AudloPilot TM digital processing monitors sound within the cabin and helps compensate for unwanted ambient noise with no perceived change in audio volume. Integrated Motorola V60″‘ dual-band digital portable telephone with in-ear voice control system for operation of commonly used phone and audio system features. In-dash navigation system uses Global Positioning System (GPS) satellites will determine the current location of his van anywhere in the Universe.